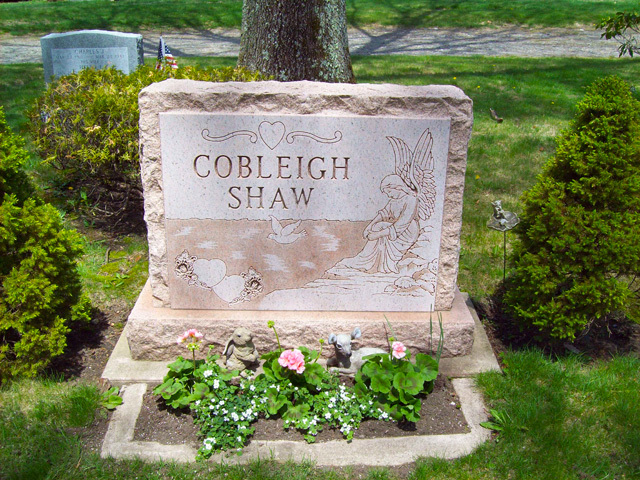 We offer upright monuments, benches, slant monuments and flush markers to lot owners of our cemetery. In order to place a monument and / or marker on a lot you must be either Deeded or inherited / assigned the Deed to the lot or given permission to do so by same. One upright monument may be placed at the center rear of the lot. Grave markers that are flush to the ground (flush markers) may be placed on each grave. Up to three markers are allowed on a full-size space. Some SECTIONS within the cemetery only allow flush markers, such as infant only and single cremations only spaces. To determine the maximum size allowed, it is 2 feet in width for every space. For example, if you have two side-by-side full-size spaces, then you are allowed a monument up to 4 feet in width. Height is negotiable. We do not, however, allow statuary. The thickness of the die (top of monument) must be 8 inches or more. Since each space is 2 feet in width, flush markers cannot exceed this width. We highly recommend that markers be at least 4 inches thick. Granite is by far the best choice and is the stone that we offer to our lot owners. It is a very versatile hardy stone that comes in various shades of grey, red, pink, green, blue, white and black. Large boulder quartz and fieldstones are also allowed. Due to deterioration problems, slate and marble stones are prohibited. The foundation installation of all monuments and markers will be performed by the Cemetery prior to placing them on the lot. We are careful to match the color of the cement with the stone you have chosen. There is a flat fee for installing foundations for markers. The fee for installing the foundation and border for monuments is based on the size of the monument. Most monument dealers are aware they must send us a MONUMENT STATISTICS CARD with the type, color, size and dimension specifications of the monument or marker for both approval and foundation installation by the cemetery. This card can be sent to you or a monument dealer upon request. No monument or marker will be received by the cemetery until the foundation installation is done and the fee for same is paid by the purchaser. Consider having an in-ground planter for flower memorial displays put in at the same time the monument is installed to create a more cohesive look that ties-in nicely with the monument. Just like the monument border, the cement planter will match the color of the stone. In-ground planters can be added at any time. Dignified and timeless. Excellent for adding numerous engravings of individual names-dates either on the front or back side of the monument. Upright dies (tops) include bases. A resting place for visitors as well. If more than one person is being memorialized, adding flush markers on each grave would be ideal. Benches come in a variety of styles including straight, curved, with a back, and kidney shaped. Readily available colors include Barre Grey, Canadian Pink, Salisbury Pink, Impala Black and Jet Black granite. Other colors can easily be ordered for you. Various sizes up to 2’ x 1’. All markers are 4” thick NAME-DATE engravings included. Also good as a companion marker. Emblems, religious symbols and other available designs may be added. For those who prefer bronze or would like to match a bronze veterans marker on the lot., color choices include light, medium and dark bronze. NAME-DATE embossing included.